Anyone else feel a little nostalgic this time of year? The beginning of a new school year signals the end of summer, even while temperatures remain hot and sunny days abound. Although we have long since outgrown the months-free, schools-out summer vacations we enjoyed as kids, summer’s end brings a sense of wistful yearning for those long, lazy days. The upcoming Labor Day 3-day-weekend is an excellent time to bid farewell to summer with cooking that epitomizes the season: low and slow barbeque. Transforming a giant slab of meat into tender morsels of smoky pork perfection is just reward for the 20 or so hours it takes to get there, and is a fitting ode to the warmest season with the longest days of the year. We adapted this recipe, and highly recommend the dual seasoning techniques of injecting the meat and applying a dry rub prior to smoking. No matter your personal barbeque style, cook some meat over open flame or coal at the lowest temperature you can go, take your time to get it done, and enjoy the heck out of your Labor Day weekend. For the injection seasoning, combine apple juice, water, brown sugar, kosher salt and Worcestershire. Stir all the ingredients together until the salt and sugar dissolve completely. For the rub, combine black pepper, paprika, brown sugar, kosher salt, dry mustard, cayenne pepper and granulated garlic. There seems to be a lot of debate among barbeque enthusiasts about whether or not to cut off the “fat cap” (the thick layer of fat covering one side of the shoulder) from the pork shoulder prior to cooking it. Some say that the fat helps keep the meat juicy and adds flavor, so if you want to remove it, you should wait until after the pork is cooked. Others point out that this cut of pork has a nice amount of fat throughout, so leaving the cap on doesn’t make much of a difference. Ultimately, we decided to trim off a good bit of the fat cap. (Trimming debate aside, can we all agree that the term “fat cap” is horribly gross and should be banned from the English language?) Cutting off the fat increases the meat surface area that will turn into the “bark” — the dark, flavorful, near-caramelized outer layer — when the pork is done. Use a marinade injector (a/k/a “meat syringe” — 2 more words that sound way gross together) to inject small amounts of the apple juice mixture all over the pork shoulder. Sprinkle a generous amount of the rub all over the pork and pat it onto the meat until the shoulder is well-coated on all sides. Cover the pork on the tray with a large sheet of plastic wrap and refrigerate for several hours, up to overnight. 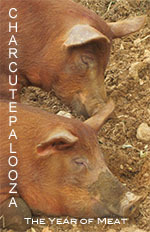 Unlike many other grilled meats, smoked pork does not need to reach room temperature before you cook it. Placing cold pork in the hot smoker actually makes for a better smoke ring in the finished product. Cooking low and slow with a smoker requires advance planning. Since we knew the pork would need about 16 hours in the smoker (plus resting time once it was done), we started the smoker part of the process at about 10:00 p.m. the night before we wanted to serve the pulled pork. We used our chimney starter to heat the coals, then set up the smoker with hot (and not hot) coals, water in the water pan and wood chips (wine barrel oak) for smoke. 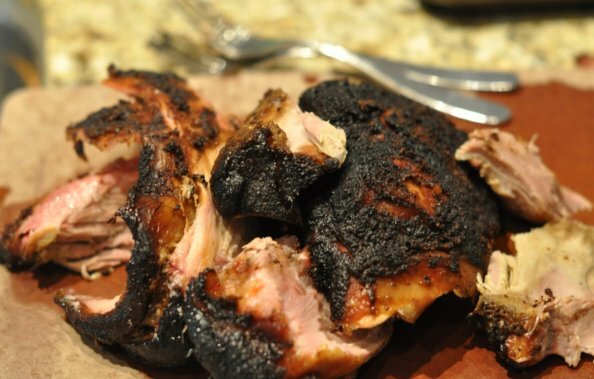 When the smoker reached 225 degrees, we put the pork in it and called it a day (er, night.) Our smoker is awesome and remained within 2-3 degrees of 225 for the entire 16 hours. Similar to the debate about trimming the pork shoulder, there are equally devisive schools of thought about whether to place the pork shoulder in the smoker fat-cap-side-down versus fat-cap-side-up (yup, I said it again — fat cap. FAT CAP.) We decided to compromise by flipping the pork over halfway through the cooking process. We have a bullet smoker, with the heat source at the bottom. So we placed the pork fat-cap-side-up to start, then turned it over in the morning so that the side with more fat would protect the meat from getting too done during the remaining cooking time. We also added a little more water to the water pan to keep the temperature consistently low. During the final few hours of cooking time, we brushed a “mop” of apple cider vinegar, cayenne pepper, kosher salt and lemon slices over the pork several times to impart even more flavor. After 16 hours in the smoker, the pork looks like this. The pork was so tender that it nearly fell off the bone by itself. Given the size of the pork shoulder we cooked, I figured the pulling would take forever. But we worked assembly-line-style, with Dan cutting the shoulder into smaller pieces and me shredding those pieces with 2 forks, and the tender pork was pulled in no time at all. We took a purist approach for our maiden pulled-pork-voyage and served it on ciabatta rolls with a North Carolina-style vinegar sauce and sides of baked beans and zucchini slaw. Simple, smoky, tender and moist (speaking of gross terms — anybody hate the word “moist” as much as Dan?) — the pork was amazing. You can taste the time and effort that goes into this kind of barbeque, and it is so very worth it. Combine the ingredients for the injection, stirring until the sugar and salt dissolve completely. Combine the dry rub ingredients in a separate container. Use a marinade injector to inject the pork all over with the apple juice mixture. Sprinkle generous amounts of the rub over the pork until the shoulder is well-coated on all sides. Refrigerate the pork for several hours, up to overnight. Prepare the smoker with wood chips of your choice and heat to 225 degrees. Place the pork in the smoker and cook for 16 hours. If using a smoker with heat source at the bottom, you may want to place the pork fat-cap-side-up to start, then flip the pork over about halfway through the cooking time. Keep an eye on the water level in the smoker water pan so that it doesn’t dry out. For the final several hours of cooking time, periodically brush the mop mixture over the pork. Allow the cooked pork to rest for at least 30 minutes and up to several hours. Wrap the pork in foil and place it in a cooler to keep it warm during this process. To “pull” the pork, cut it away from the bone, shred using 2 forks and serve. to read this blog, and I used to visit this website every day.